The Timberwolf history is the story of a combat Infantry Division. The 104th Infantry Division did not win the war. We make no such far- reaching claim . . . but the Timberwolves did play a most effective role in crushing the iron fist of Nazidom. It is fitting that this history be dedicated to those of our gallant comrades who went forth with us to battle, but when the battle ended, did not return. It is to those brave officers and men who, from the canals of Holland to the banks of the Mulde, have written a tale of courage that we offer this history as our tribute. We know that no word of ours can pay them adequate honor; rather is it from their names and their deeds that honor comes to us. After peace had been won, the 104th formed for its last parade. Though the flags have been furled and each of us have gone our separate way, we shall never forget that many of this Division keep their ranks formed forever as they lie sleeping in the perpetuated fields of nine American Cemeteries of Europe or returned to private resting places in the bosom of their home land. 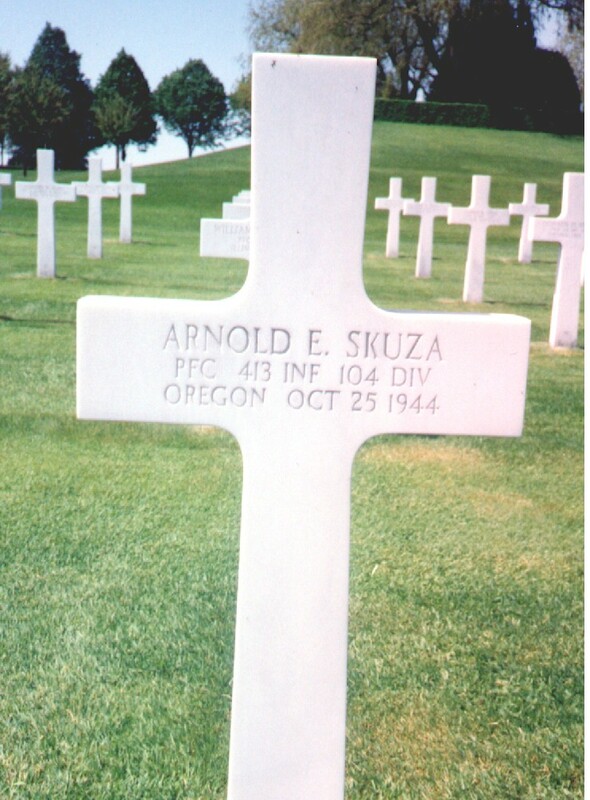 The grave of Pfc Arnold Skuza (Co. I, 413th Inf), American Cemetery, Henri-Chapelle, Belgium, is shown as symbolic of the final resting places of the 1473 Timberwolves killed in combat, 19 reported missing in action and the 51 non-battle deaths suffered by our comrades while in Europe. Pfc Arnold Skuza represented the highest military standards of our Division when in June 1943 he was one of only 103 selected as the Division's first "Wolf Scouts". This prime group was selected following a three-day physical fitness and mental alertness test that judged them on their physical condition, knowledge of weapons, and other essentials of a skilled infantryman. In his customary role as "First Scout", lead man of one of the first combat patrols of the Division to contact the enemy, Pfc Skuza was killed by enemy fire in an approach to Heilbloom, Holland on 25 October, 1944.